Children today have all sorts of stuff to keep them occupied and help them learn interesting things, while having fun. Movies. Interactive e-books. Games. Magazines. Plus all kinds of devices that come in handy when learning something new. And now, Blackfish Children’s Books brings them yet another fun learning tool. At first, I expected Blackfish Children’s Books to be just another e-book, part of a collection that teaches children useful stuff through beautiful images and interactive games. But Blackfish Children’s Books is so much more. 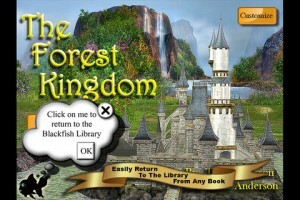 It’s an entire library, where you can download or purchase all sorts of fun and educational e-books for your child. One of the first things you learn as a child, way before reading, writing, and even how to dress yourself, is the importance of having clean and healthy teeth. And although there are so many yummy tasting toothpastes and funny looking tooth brushes out there, sometimes it’s hard to make your child develop a habit out of brushing his teeth. But what if there was an interactive story that didn’t only teach them how to brush their teeth, but also make it appealing to them by turning tooth-brushing into a funny experience? 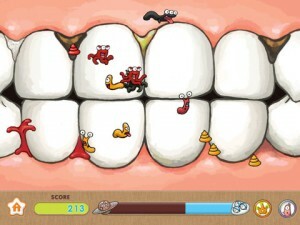 This is what Tooth Monster is all about. Children love stories and they always want you to read a new one for bedtime. With the iPad, you can browse through hundreds of apps and stories that will save you the time of making up those once upon a time stories. And Joy Tales are just that, tales that will surely make your child fall asleep peacefully every night. The app is available only for the iPad and it features one free story (TAB the bat) and 11 more original ones that you can download via InApp purchase. The story of TAB the bat begins in the castle upon the hill. 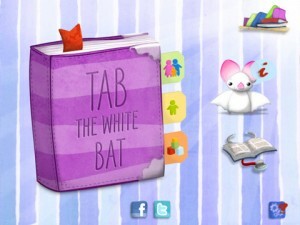 TAB is a white bat amongst a family of black bats and through a series of animated scenes, he will learn that being different has its advantages. The story is cute and inventive, without complicating the storyline too much though. It’s definitely suited for children ages 2 to 4. Genie, Dapper and Rex form a unique group of pranksters. They’re fun, loving animals, who prove that there’s no reason why cats and dogs shouldn’t get along. And even if Genie and Dapper, the two spirited cats, are always up to something, Rex the dog is always there to look after them, and sometimes get carried away in their pranks. Now they are all on their way to the country, and, knowing them, there’s no doubt that they’ll come back with a lot of stories to tell. 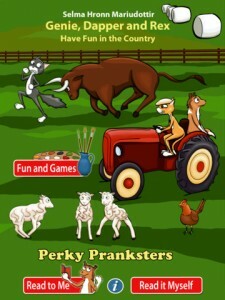 So, if you want to find out all the pranks that these funny characters pulled off on their trip, download Perky Pranksters: Have Fun in the Country, and enjoy their great stories together with your child. Balloons, presents and friends gathered together, singing Happy Birthday. This is all you need to throw a great birthday party for someone. But when that someone is a playful little puppy, things might not go exactly as planned. 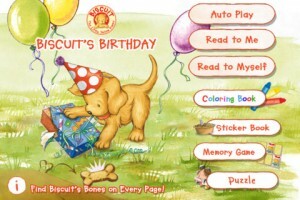 If you want to find out more, get Biscuit’s Birthday from the AppStore, and read all about this adorable pup’s special day in this children’s book. Biscuit’s Birthday is a beautiful book for all children, no matter if they’re just learning to read or they’re looking for a nice story to enjoy. From the wonderful graphics to the funny plot, Biscuit’s Birthday is guaranteed to bring a smile to any reader’s face. Plus, it’s also extremely helpful, its main purpose being to help your child improve his reading, while enriching his vocabulary. Deep inside the jungle, there lives a tiger cub, that today must learn how to hunt. His mommy is hurt, so it’s his turn to take care of her, protect her, and feed her. But he is so tiny and sweet. What could he possibly be able to hunt? Follow this tiny cub as he is trying to learn how to hunt, and find out just how important it can be to find a friend that you can rely on. 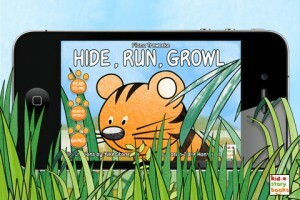 Buy Hide Run Growl from the AppStore and watch your kid get mesmerized by this wonderful story. How many times did you find yourself complaining to other parents about the videos that your children watch on TV or on the Internet? It’s hard enough to keep track on what they’re watching when you’re at home, and sometimes impossible while you’re at work. But now, you can give him another option, a better option, one that you can have total control over. Enter Video Baby on the AppStore.